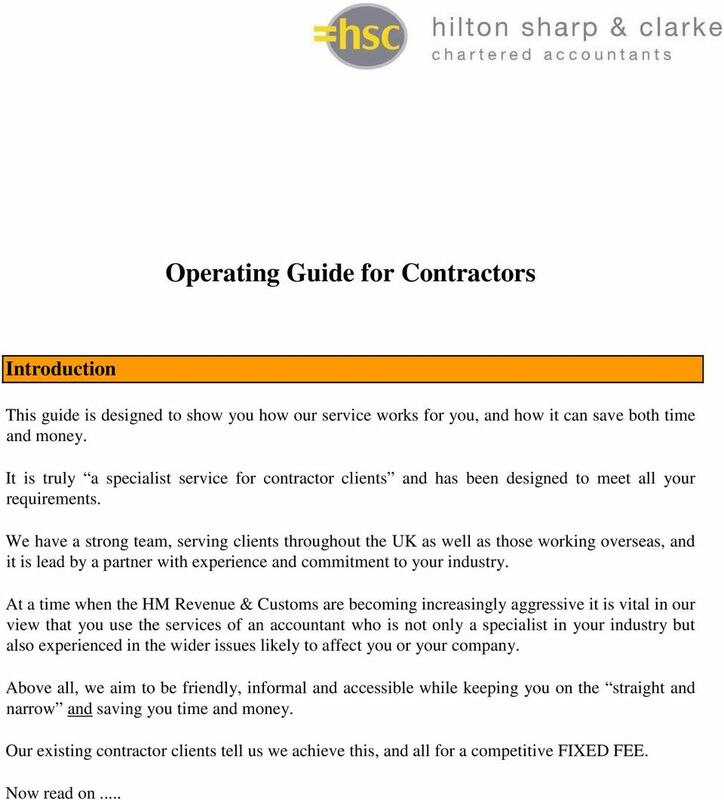 Download "Operating Guide For Contractors"
3 1. 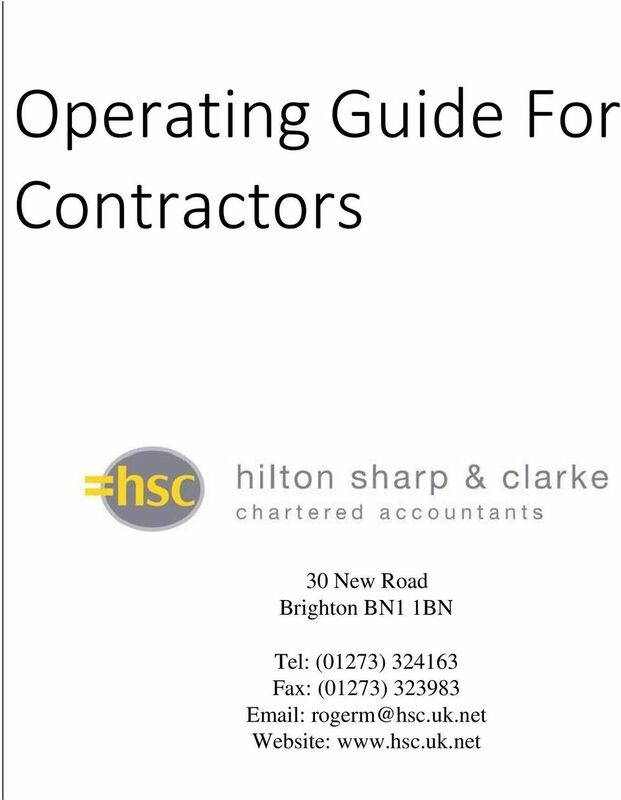 The Company Structure Even with the IR35 tax legislation it is still advantageous for a contractor to operate through a limited company. We can set up a company, using a name of your choice, within 24 hours. We will advise you on all considerations such as shareholdings, location of registered office and service address, maintenance of statutory records, appointment of directors and service address, and the company s year end date for accounting purposes. 2. 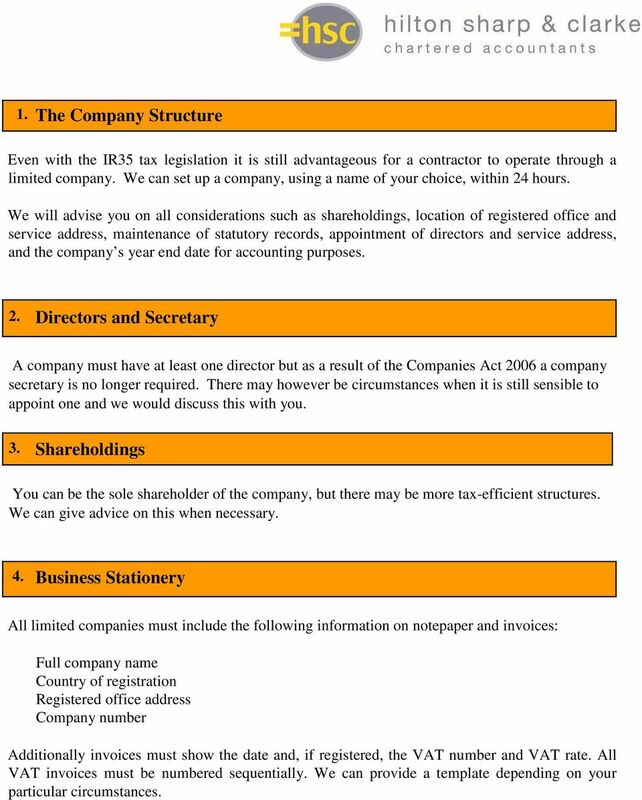 Directors and Secretary A company must have at least one director but as a result of the Companies Act 2006 a company secretary is no longer required. There may however be circumstances when it is still sensible to appoint one and we would discuss this with you. 3. Shareholdings You can be the sole shareholder of the company, but there may be more tax-efficient structures. We can give advice on this when necessary. 4. Business Stationery All limited companies must include the following information on notepaper and invoices: Full company name Country of registration Registered office address Company number Additionally invoices must show the date and, if registered, the VAT number and VAT rate. All VAT invoices must be numbered sequentially. We can provide a template depending on your particular circumstances. 4 5. VAT If the company s sales exceed 81,000 in any twelve month period it must register for VAT. This means that it will have to charge VAT on all of its invoices to customers, but can reclaim VAT on business expenses depending on the type of scheme it is registered under. It may save you money to register under the flat rate VAT scheme. We can discuss the options with you and advise on the most suitable scheme and where necessary complete the relevant application form on your behalf. 6. Bookkeeping All you have to do is complete our bookkeeping data sheets, which can be sent to you paper based or electronically in excel format. 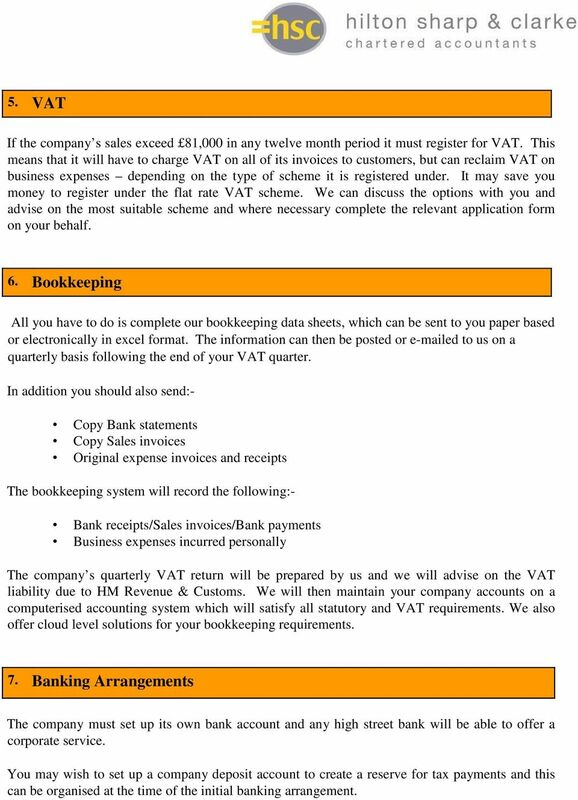 The information can then be posted or ed to us on a quarterly basis following the end of your VAT quarter. In addition you should also send:- Copy Bank statements Copy Sales invoices Original expense invoices and receipts The bookkeeping system will record the following:- Bank receipts/sales invoices/bank payments Business expenses incurred personally The company s quarterly VAT return will be prepared by us and we will advise on the VAT liability due to HM Revenue & Customs. We will then maintain your company accounts on a computerised accounting system which will satisfy all statutory and VAT requirements. We also offer cloud level solutions for your bookkeeping requirements. 7. Banking Arrangements The company must set up its own bank account and any high street bank will be able to offer a corporate service. You may wish to set up a company deposit account to create a reserve for tax payments and this can be organised at the time of the initial banking arrangement. 5 8. Extracting Profits from the Company With the introduction of the HM Revenue and Customs IR35 legislation the way a company operates and the way monies are taken from the company are determined by what the employment status of the contractor would be in the absence of the company. If the manner in which you carry out your contracting duties would be regarded as self employment in the absence of the company then you can run your company as a business taking a relatively low salary for national insurance purposes and the balance of earnings as dividends. 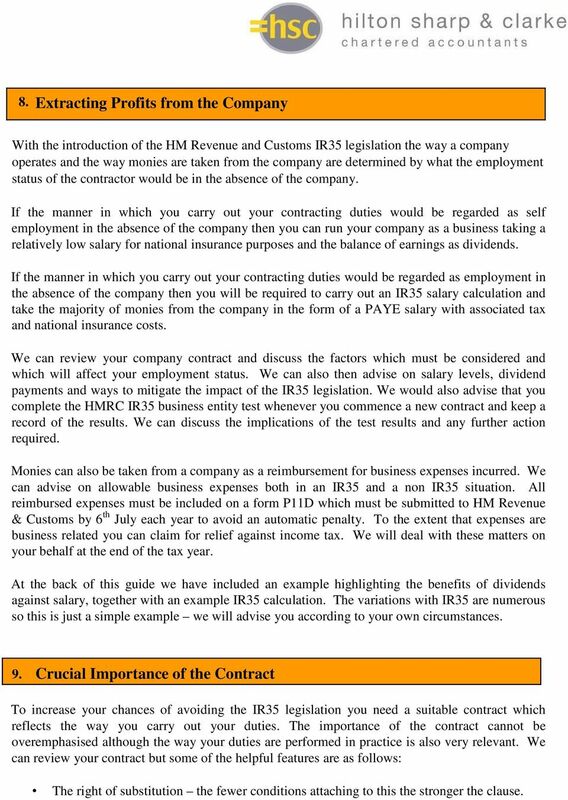 If the manner in which you carry out your contracting duties would be regarded as employment in the absence of the company then you will be required to carry out an IR35 salary calculation and take the majority of monies from the company in the form of a PAYE salary with associated tax and national insurance costs. We can review your company contract and discuss the factors which must be considered and which will affect your employment status. We can also then advise on salary levels, dividend payments and ways to mitigate the impact of the IR35 legislation. We would also advise that you complete the HMRC IR35 business entity test whenever you commence a new contract and keep a record of the results. We can discuss the implications of the test results and any further action required. Monies can also be taken from a company as a reimbursement for business expenses incurred. We can advise on allowable business expenses both in an IR35 and a non IR35 situation. All reimbursed expenses must be included on a form P11D which must be submitted to HM Revenue & Customs by 6 th July each year to avoid an automatic penalty. To the extent that expenses are business related you can claim for relief against income tax. We will deal with these matters on your behalf at the end of the tax year. At the back of this guide we have included an example highlighting the benefits of dividends against salary, together with an example IR35 calculation. The variations with IR35 are numerous so this is just a simple example we will advise you according to your own circumstances. 9. Crucial Importance of the Contract To increase your chances of avoiding the IR35 legislation you need a suitable contract which reflects the way you carry out your duties. The importance of the contract cannot be overemphasised although the way your duties are performed in practice is also very relevant. We can review your contract but some of the helpful features are as follows: The right of substitution the fewer conditions attaching to this the stronger the clause. 6 9. Crucial Importance of the Contract (continued) A minimum amount of control or supervision over your duties by your client giving particular regard to what duties you will be required to carry out and how these duties will be performed. Consideration of the mutuality or obligation contained in the contract An element of financial risk for example: - a requirement to make good defective work - raising an invoice against which payment is made - receiving a daily rate for services An intention to show this is a contract for services and the relationship is not one of employer/employee. The contract is to complete a task or project rather than to be for a set period of time and there is flexibility regarding the place of work and hours worked. This is not an exhaustive list but merely an indication of the key areas. 10. Financial Planning All this advice is provided by our own Hilton Sharp & Clarke Financial Services Limited. 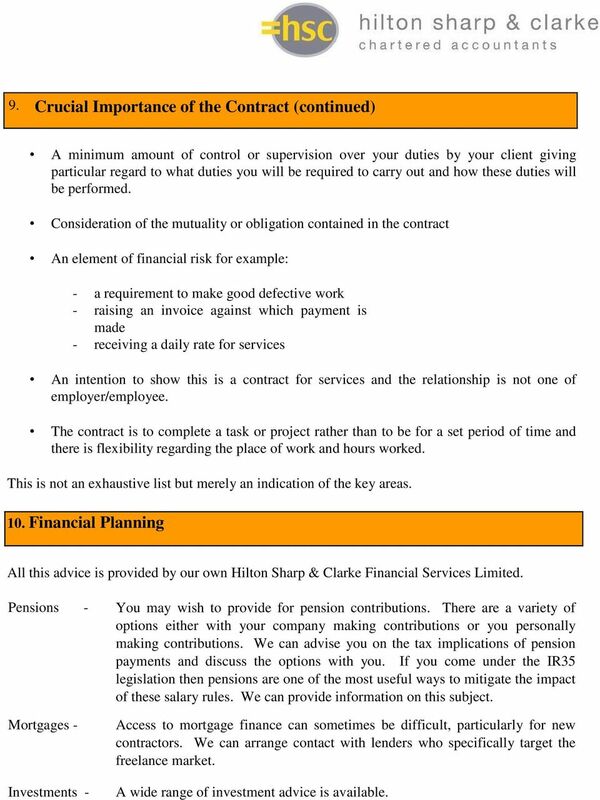 Pensions - You may wish to provide for pension contributions. There are a variety of options either with your company making contributions or you personally making contributions. We can advise you on the tax implications of pension payments and discuss the options with you. If you come under the IR35 legislation then pensions are one of the most useful ways to mitigate the impact of these salary rules. We can provide information on this subject. Mortgages - Investments - Access to mortgage finance can sometimes be difficult, particularly for new contractors. We can arrange contact with lenders who specifically target the freelance market. A wide range of investment advice is available. 7 11. 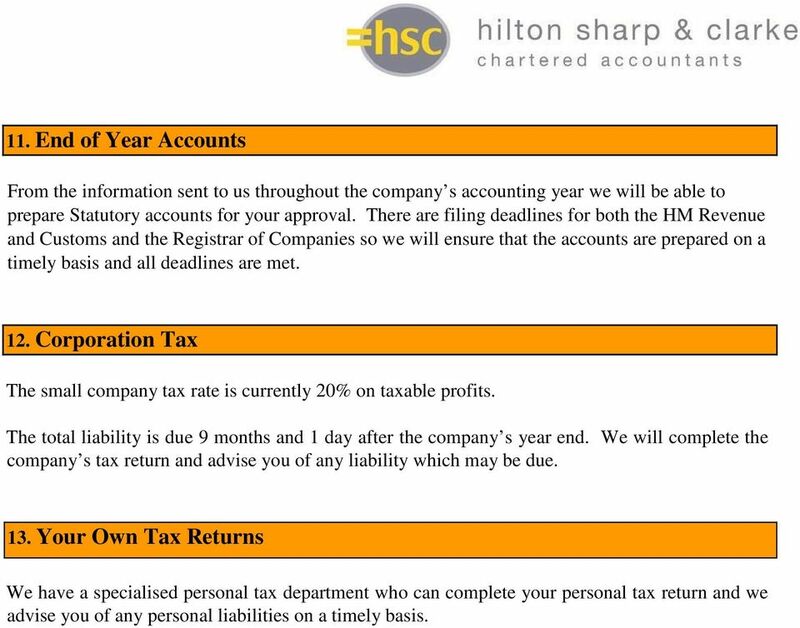 End of Year Accounts From the information sent to us throughout the company s accounting year we will be able to prepare Statutory accounts for your approval. There are filing deadlines for both the HM Revenue and Customs and the Registrar of Companies so we will ensure that the accounts are prepared on a timely basis and all deadlines are met. 12. Corporation Tax The small company tax rate is currently 20% on taxable profits. The total liability is due 9 months and 1 day after the company s year end. We will complete the company s tax return and advise you of any liability which may be due. 13. Your Own Tax Returns We have a specialised personal tax department who can complete your personal tax return and we advise you of any personal liabilities on a timely basis. 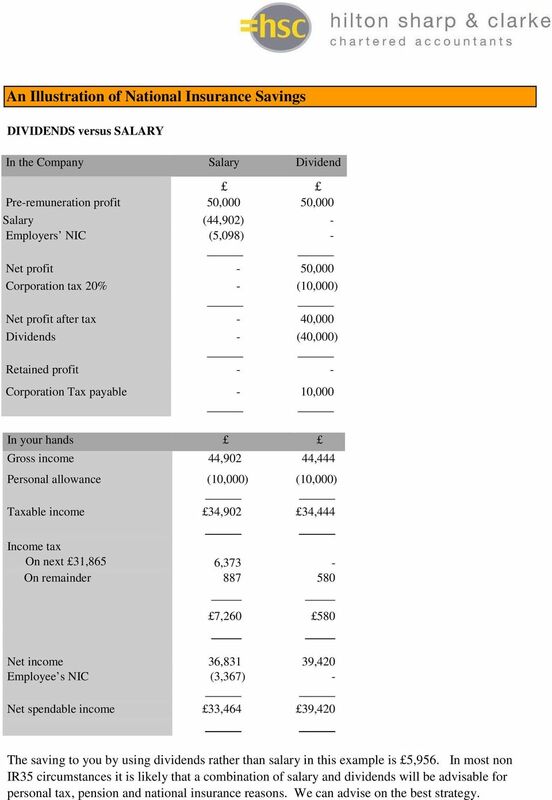 8 An Illustration of National Insurance Savings DIVIDENDS versus SALARY In the Company Salary Dividend Pre-remuneration profit 50,000 50,000 Salary (44,902) - Employers NIC (5,098) - Net profit - 50,000 Corporation tax 20% - (10,000) Net profit after tax - 40,000 Dividends - (40,000) Retained profit - - Corporation Tax payable - 10,000 In your hands Gross income 44,902 44,444 Personal allowance (10,000) (10,000) Taxable income 34,902 34,444 Income tax On next 31,865 6,373 - On remainder , Net income 36,831 39,420 Employee s NIC (3,367) - Net spendable income 33,464 39,420 The saving to you by using dividends rather than salary in this example is 5,956. In most non IR35 circumstances it is likely that a combination of salary and dividends will be advisable for personal tax, pension and national insurance reasons. We can advise on the best strategy. 9 IR35 Salary Calculation Company turnover Less: 5% flat rate allowance Travel and subsistence (under the current 2 year rules) Pension contributions to an approved pension scheme Professional indemnity payments Professional subscription payments Expenses incurred wholly, exclusively and Necessarily in the performance of your duties Benefits in kind Salary and national insurance already paid Balancing salary and national insurance payments Example: Company turnover 65,000 5% allowance (3,250) Travel and subsistence costs (4,750) Monies to be paid out 57,000 Split Employers NI 5,947 Gross Pay 51,053 57,000 On the gross pay above, total deductions for tax and employees NI would be 13,551 giving rise to a net pay of 37,502 or just under 3,125 per month. 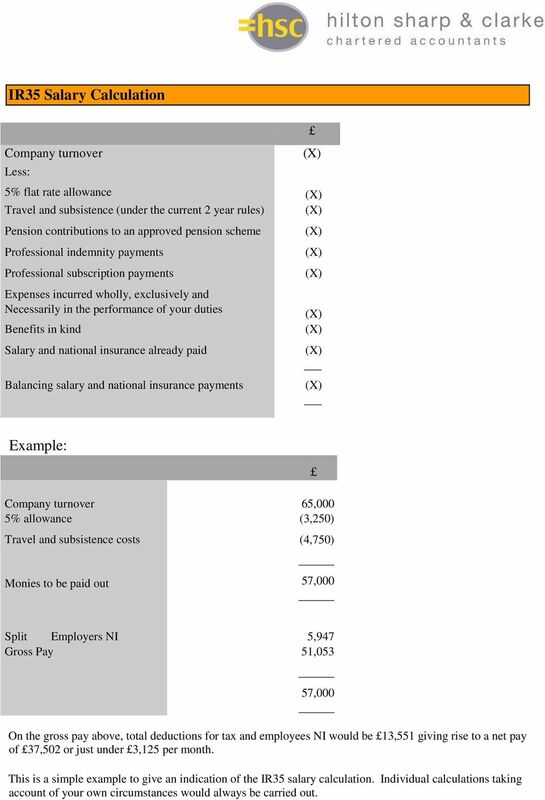 This is a simple example to give an indication of the IR35 salary calculation. Individual calculations taking account of your own circumstances would always be carried out.